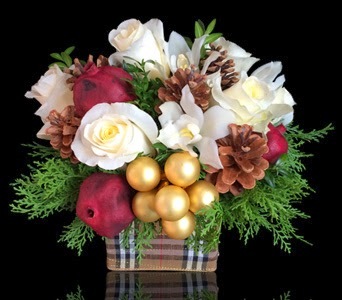 A classic, lush design of premium roses and cymbidium orchid blossoms accented with seasonal evergreens, dried pomegranets, natural pinecones and ornaments created within a glass vase banded with a classic plaid ribbon. A must for your holiday table and a perfect gift for a special person in your life! Browse all of our custom floral arrangements.